Bing Bang is Rolando Peña’s individual show to open at the contemporary art space Connect Now Room of the Arts Connection Foundation. The art show, conceived in the city of Miami in 2017, represents his most recent production. It comprises seventeen images and a video work where Peña examines the cosmological model of the Big Bang theory and its incidences on the ways we interpret the various dynamics that build and shape human realities. Under this vision Rolando Peña experiments paths to build a unique narrative sequence. Thus, using the oil-barrel image (whose iconography is fundamental in the framework of his aesthetic researches), the image acts as a unit able to expand through fraction, to simulate through a horizon line, a representation inspired in the theory of cosmic inflation developed by Alan Guth (New Brunswick, USA 1947), Andréi Linde (Moscow, Russia, 1948), Paul Steinhardt (Washington, D.C. USA 1952) and Andreas Albrecht (Ithaca, USA, 1957). 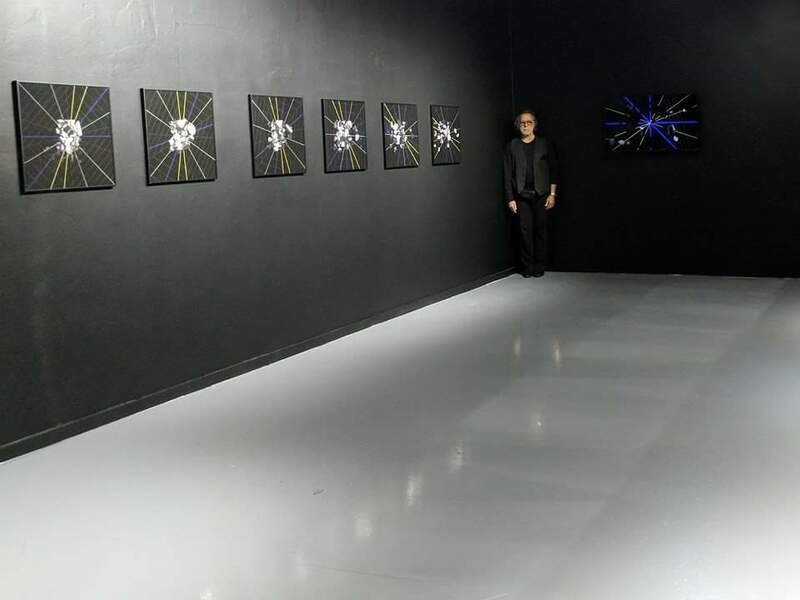 The exhibition’s art pieces provide a linear structure whose flatness, whose horizon, rises as a metaphor of the universal exponential growth, when the barrel image expands in thousand parts representing the gravitational waves or the wrinkles of space-time. The narrative constant dynamic mechanism posed by Rolando Peña is a graphic model of a linguistic universe that suggests a revision of our relationship with the environment and the notions of reality, expansion and decomposition. The undeniable acoustic condition of the phenomenon, the gradual way in which the image disintegrates in the darkness of empty space and the manner to critically deconstruct the scientific tale refer us several times to Four Songs, 1976 by Bill Viola (Queens, NY, USA, 1951). It is due to the allegory of its conceptual relationship with the psychological dynamics of the individual and the environment, because of the variations of the form in space that resemble a nocturnal internal landscape and of the extraordinary negotiation among extremes: light-darkness, order-chaos, matter-mind, finite-infinite. Under these points of view, Rolando Peña builds a sort of new place to imagine or analyze the epistemic and aesthetic implications of a founding moment of matter. In this regard, the proposal is closely linked to the artist’s concerns and interests in reviewing the use and abuse of a natural resource such as oil, capable of reproducing a chaotic system or relevant social, political, economic and cultural unbalances. In perspective these orders of human activity seem to repeat natural cycles resulting towards a line of construction and deconstruction of every civilization and societies comprising them. There is a permanent longing for totality rising from the conflict in Peña's work. We can suggest that both the exhibition project Rolando Peña: Black Gold, held in 2016 at the Museum of Contemporary Art North Miami (MOCA), and the Big Bang exhibition that is currently drawing our attention represent two complementary movements within Rolando Peña's complex creative process. Both proposals announce a break in the artist’s researches since they evoke a dimension we will try to describe as psycho/cosmographies in movement. This vision, which integrates the psyche and the cosmos in a systemic glance, articulated in the Black Prince’s work, represents an untold way, a new window where the metaphor of the “black gold” will only be a memory, whose creative explosion will open alternatives to the genesis of a totality as a collision universe based on art and the endless search for new language forms.